Freedom of religion is an important American value, which is why it is already protected by the First Amendment of the Constitution. That freedom doesn’t give people the right to impose their beliefs on others or to discriminate. In January 2018, the Trump Administration’s announcement of a new Conscience and Religious Freedom Division within the Department of Health and Human Services, and proposed rules that seek to radically expand the ability of health care providers to deny patients care based on religious or moral beliefs. 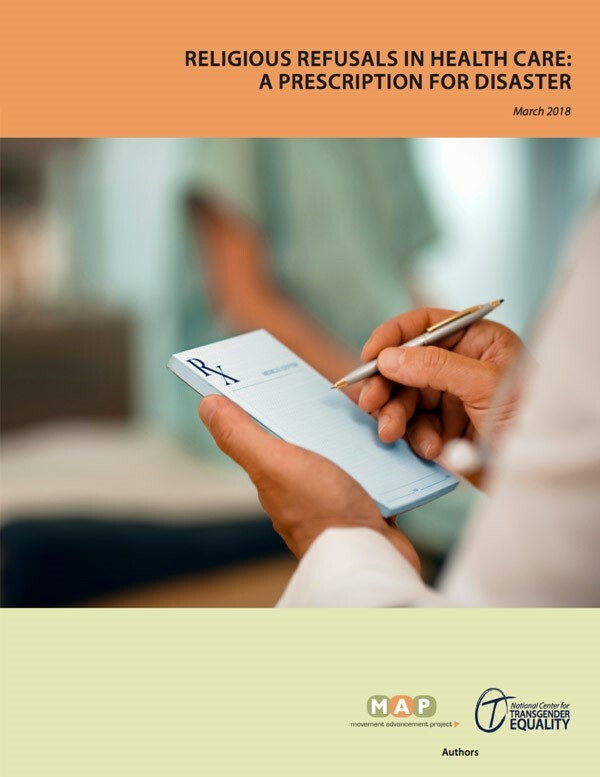 In response, the Movement Advancement Project (MAP) and the National Center for Transgender Equality (NCTE) released a new report, Religious Refusals in Health Care: A Prescription for Disaster. The report examines the coordinated efforts to allow medical providers to legally discriminate and deny needed care—from the recent actions at the federal level to the lack of nondiscrimination protections at the state level. Creating a health care system when patients' health comes second to health care providers' personal beliefs. Movement Advancement Project and National Center for Transgender Equality. March 2018. Religious Refusals in Health Care: A Prescription for Disaster. http://www.lgbtmap.org/Religious-Refusals-Health-Care-Report (date of access).